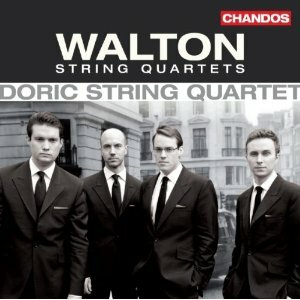 Given the relative paucity of string quartet repertoire from the UK, it is surprising that Walton's two contributions to the genre are not heard more often. In the case of his earliest quartet, there are a number of historical factors to explain the fact, but the later quartet is a very fine work indeed. Perhaps if the Elgar and Delius quartets didn't make such a convenient CD-length pairing, we'd get to hear this one more often. The quartets are unnumbered because Walton considered the first a student work. True enough, he was an undergraduate when he started it. A dodgy first performance didn't help its prospects, which Walton first attempted to improve by introducing major cuts. He later gave up on the whole thing and withdrew the work. Up until now, the work has only been recorded in its shortened form, and this is the first recording of the full version. Walton described the work as 'full of undigested Bartók and Schoenberg', which to my ear is only partly true. He certainly goes for Schoenberg's contrapuntal style when it comes to string quartet writing, and the tonal basis for the music is often difficult to pin down. But on the whole this is a very civilised and very English response to central European developments. The urge to cut the score is understandable, if it has one major failing it is that it overstretches its material, and the fugal finale, clever as it is, would make a stronger impact if it were more concise. But that is the only aspect of the music that betrays its student origins. By contrast, the maturity and accomplishment of the A minor quartet is everywhere apparent. The music here is in the mould of the First Symphony, echoes of which regularly peep though the textures, giving added support to the music's symphonic scope. The Presto second movement in particular, could almost be a transcription of the First Symphony's Scherzo. And unlike the earlier quartet, this work really hangs together and fully justifies its almost half hour length. The performances are excellent throughout: lively, focussed and with plenty of timbal variety. The Doric Quartet clearly live this music, to such an extent that they even dress in sharp Walton-style suits for the liner photographs. There is simply nothing to fault in their technique or ensemble. The sound too is very good. Potton Hall provides a warm but clear acoustic, creating an audio environment that is both inviting and engaging. The pizzicatos in the A minor Quartet's Largo movement really benefit from the warmth of the sound, taking on a lilting bounce. There is plenty of bass in the mix, so the cello comes through well, yet the balance is finely judged throughout. The track record of Chandos when it comes to promoting British music is as good as anybody's, so it is no surprise that a recording of this quality should come from them. Both quartets have their competitors on CD (although the first only in the shortened version) but there is still plenty of space in the catalogue for a recording with this level of commitment, insight and audio quality.